THE luxurious carpets produced by Adelaide’s only ever carpet manufacturer EC Group are such that they deserve to be on a pedestal alongside other South Australian stars such as Penfolds Grange wine, Haighs chocolates, Coopers beer and San Remo pasta. The internationally recognised carpet maker thrives by producing some of the world’s highest quality carpets based on leading design, premium quality and the naturalness of its products. 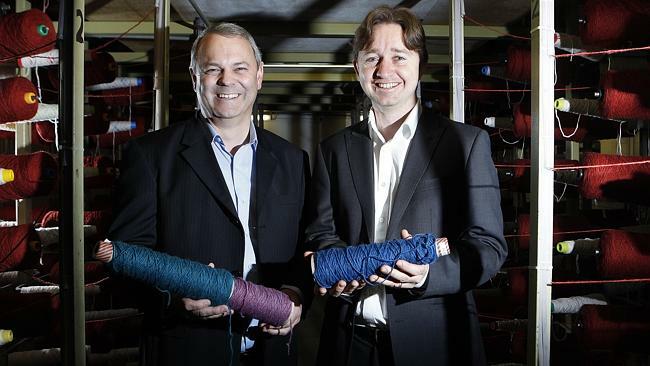 General manager Chris Timberlake said the EC Group is highly regarded for its colourful, high quality carpets, but for all its success, there is little awareness about the company in South Australia. “What we do is very special and deserves to be widely recognised,” Mr Timberlake said. The success of its carpets in homes and prestigious commercial buildings shows that manufacturing can succeed in South Australia through a shrewd approach and by producing products that the market wants. The boutique carpet maker has carpeted high profile locations including the Lexus Design Pavilion in the Birdcage at Flemington Racecourse, the new Watson Apartments in Walkerville and Etihad stadium in Melbourne. Its carpets are also in many commercial locations including the IBIS Hotel in Adelaide, Westminster School, Flinders University, government departments here and interstate, architect designed homes and in various locations in London and Chicago. “We aim to be the carpet brand of choice for designers, architects and homemakers by better understanding their needs and delivering innovative, high quality solutions to meet those needs,” marketing and brand strategist Ben Grace said. EC Group, one of only eight or nine significant carpet makers still operating in Australia, produces premium quality carpets that are defined by their softness, long life and strength. It was founded in 1963 by flooring specialist Doug Grace, a man who never held back from giving something a go. Originally known as Edwardstown Carpets, he built it into a unique carpet maker by the time of his death in 1995, when its ownership passed to his four sons. The company employs 35 people, mainly in Adelaide, and produces about 20,000 square metres of carpets a week. Managing director Phil Grace said EC Group is punching well above its weight, marketing its premium carpets to prime locations, due to their unique quality. While growth has been a challenge in the past four or five years, partly due to the high Australian dollar, the company is confident about a very bright future. “We see significant growth potential in the health and aged care sector and in export markets because we are very price competitive, despite the high quality of our carpets,” Mr Phil Grace said. It produces solution-dyed nylon and polypropylene carpets at its Edwardstown headquarters as well as its premium wool carpets using specialty carpet wool processed in New Zealand or Indonesia (because Australia produces extremely limited quantities of carpet wool). Product development director Ken Grace said its Edwardstown mill makes outstanding quality wool carpets compared to the rest of the world. “We place high importance on wool because it is a natural fibre and can provide great colour and visual effects," he said. “Wool has many benefits including being a natural insulant making wool carpet great for helping keep homes warm in winter and cool in summer. Mr Ken Grace said it also focuses on recycled products such as the use of recycled fishing nets and waste processed into synthetic yarn carpets in Slovenia. Mr Timberlake said he really enjoys working on architect designed homes because they provide the greatest opportunity for design flair. “We also love working on places such as unique boutique hotels and design orientated spaces which are willing to push design a little further,” he said. “Wool is naturally biodegradable and is also a renewable resource, while it also delivers benefits when it comes to fire, noise reduction and air purification rating. “At the end of the day, you want wool carpet because there is nothing like having wool carpet underfoot. One of the important aspects of the business is a very strong ethical base in all parts of the company, making it a unique place to work, Mr Timberlake said.